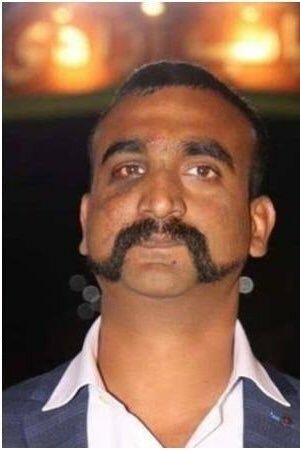 Thread by @anshul_aliganj: "Why I Am A Bad Hindu Some important facts about Ram Janbhoomi and Babri Masjid issue. 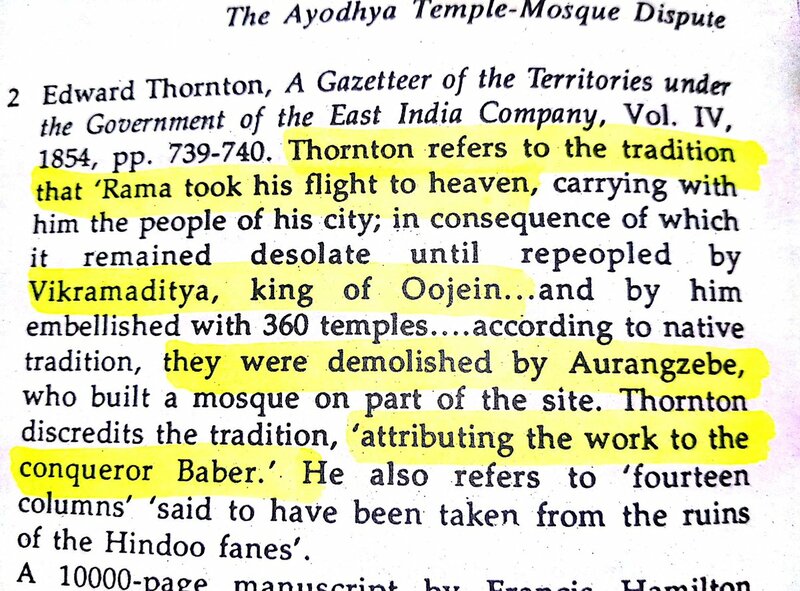 The idea is that before we talk of reconstruction we s […]"
Edward Thornton in 1855 wrote in A Gazetteer of the Territories under the East India Company about the destruction of the temple built by vikramaditya of oojein at ayodhya by baber. 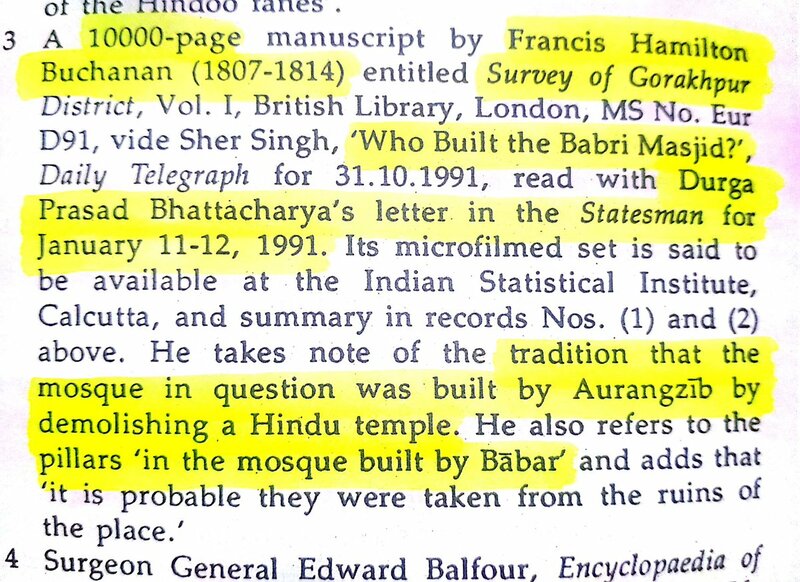 A 10000- page manuscript by Francis Hamilton Buchanan (1807-1814) titled Survey of Gorakhpur. 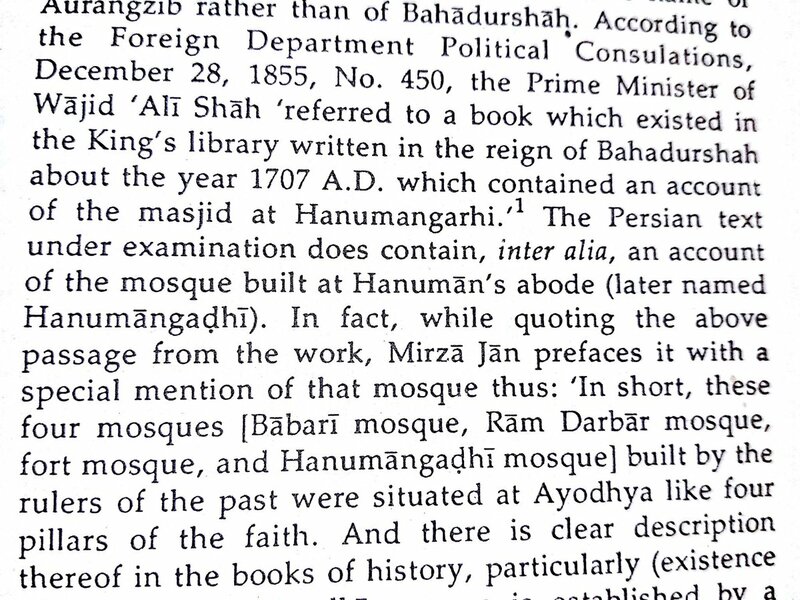 It clearly states that the mosque was built by demolishing the temple by Aurangzeb and the pillars of the mosque was built by Babar. P. Carnegy, A Historical Sketch of tehsil Fyzabad with the old capitals Ajudhia and Fyzabad, Lucknow 1870. 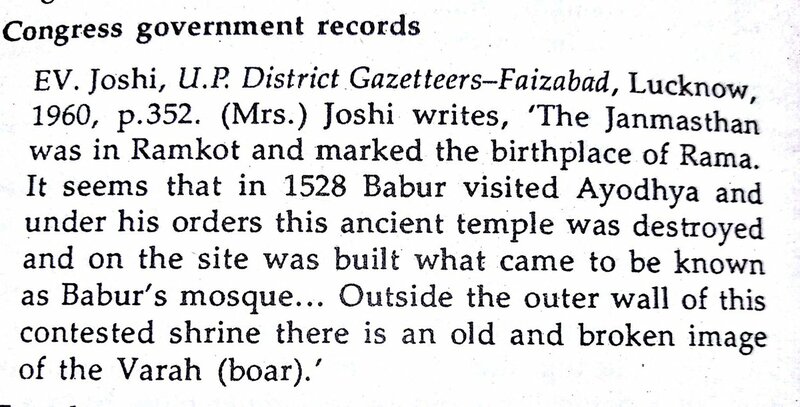 He states that Babar built the mosque at the Janmasthan. A railing has been placed since the british rule outside the fence where hindus have their platform. 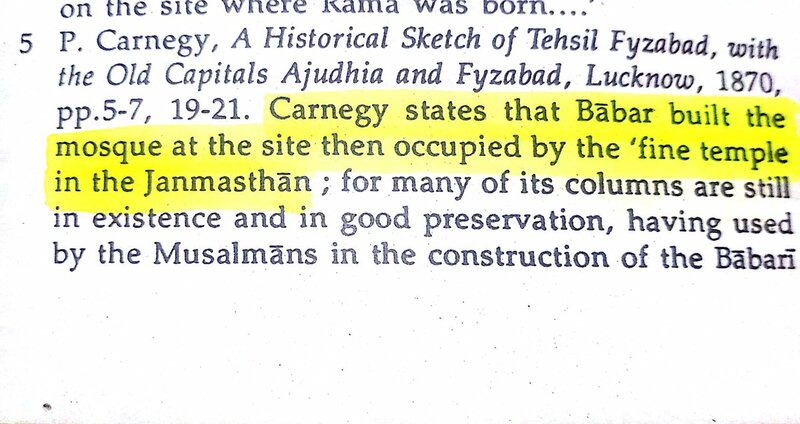 Col JEA Chamier, district judge Fyzabad in 1886 in an appeal said that it is most unfortunate that masjid should have been built on land specially held sacred by Hindus but event happened 356 years ago it is too late. 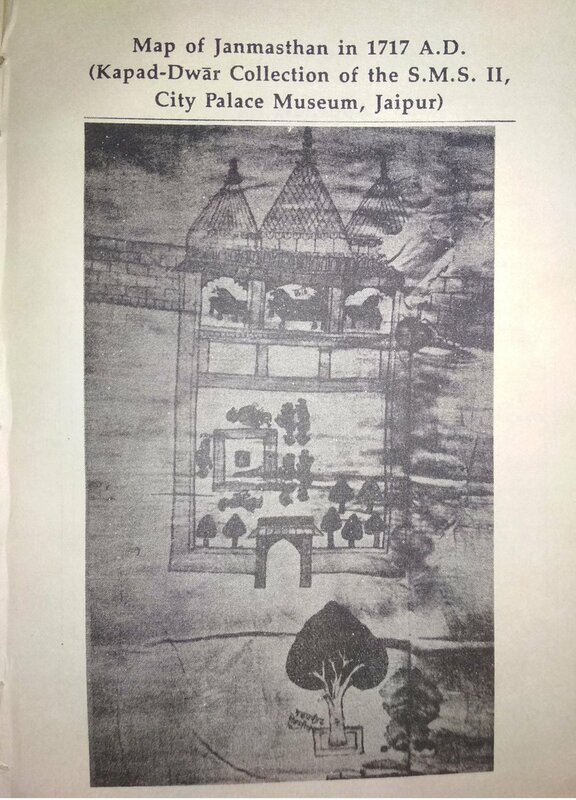 Al-Hind-u fial - Ahd Al Islami by Maulana Hakim Sayyid And Al Hayy translated to urdu by Shams Tabrez Khan under the title Hindustan Islami Ahd mein and introduced by author's illustrious son Maulana Abu I-Hasan Ali Nadani alias Ali Mian. 1. 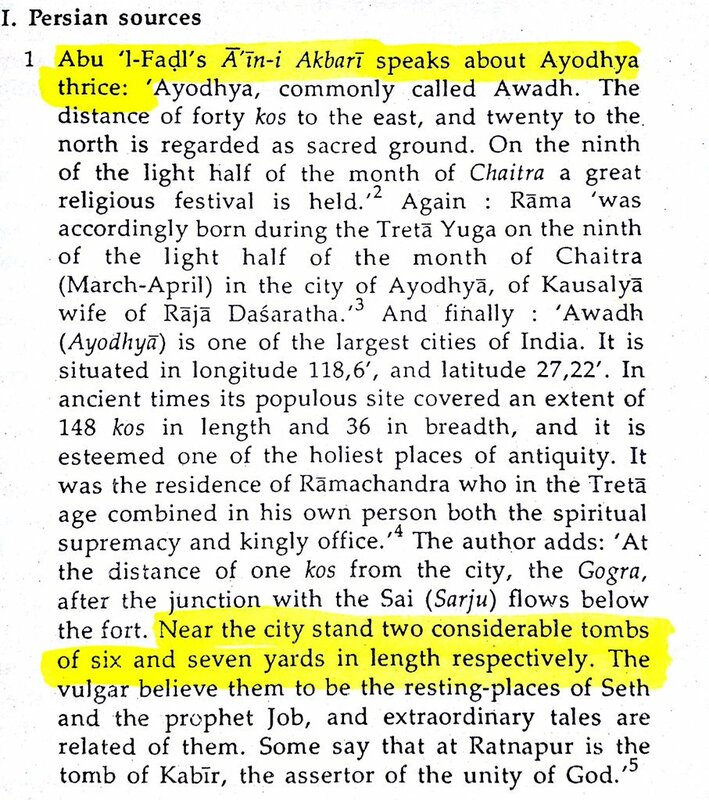 Abu I -Fadl's A in -i Akbar mentions about Ayodhya and says about Ram was born to Dashrath in Treta and says that there were 2 tombs and vulgar believe them to be the resting place of Seth and prophet job. 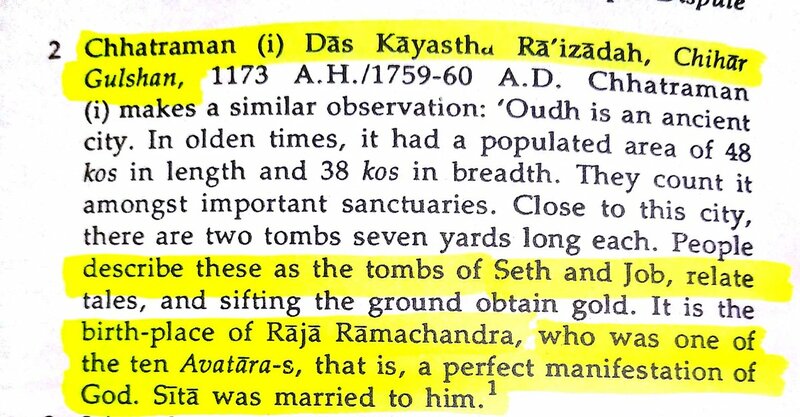 Chhatra man (I) Das Kayastha Raizadah, Chahat Gulshan 1759 also says about tombs of Seth and Job. 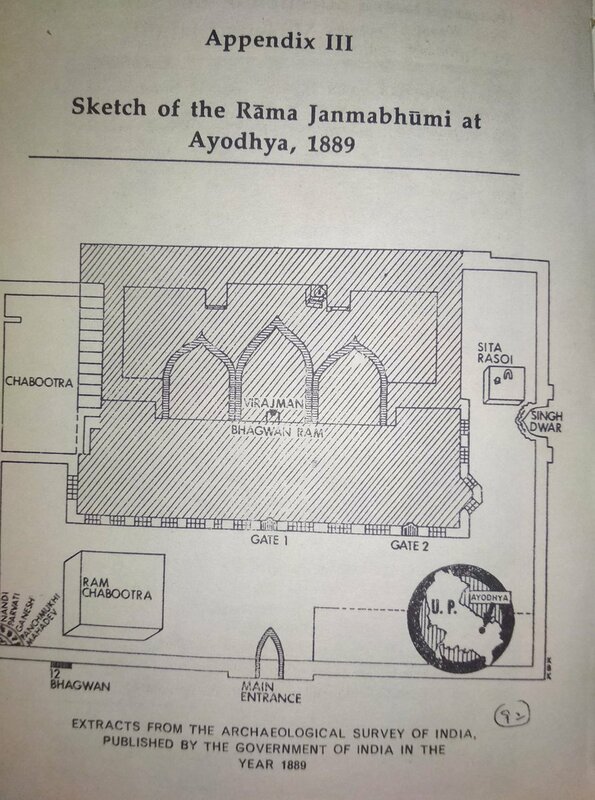 It is the birth place of Raja Ramchandra. 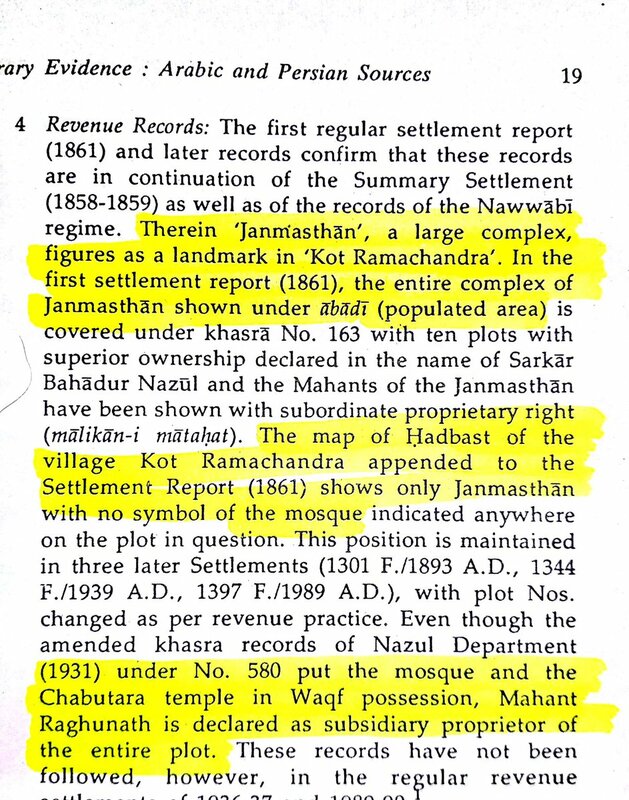 Settlement reports1861 calls it janmasthan.The map of Hadbast shows only janma sthan with no mosque.Even though the mosque and chabutra came under waqf in 1931 still Mahant Raghunath was subsidiary proprietor of entire plot. 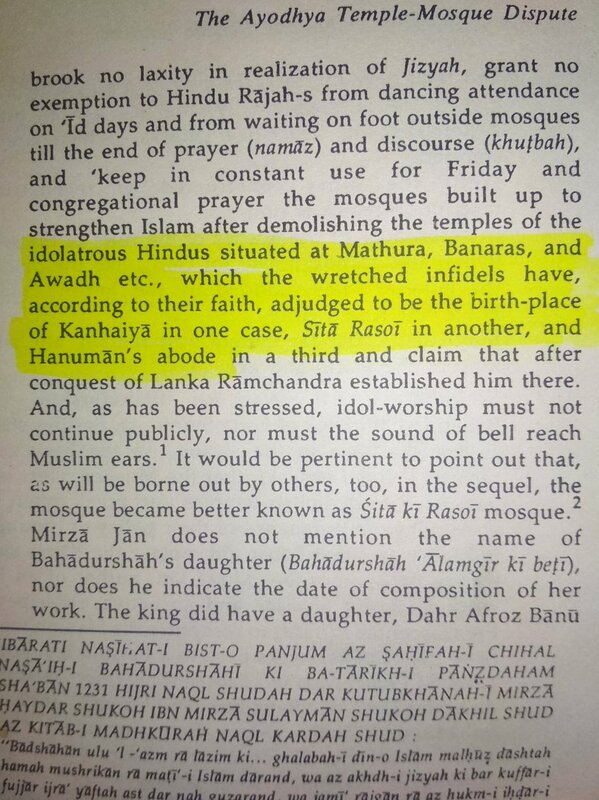 Aurangzeb granted Oudh to Sawai Raja Jai Singh Kachcha aha(1699-1743) ruler of Amer. 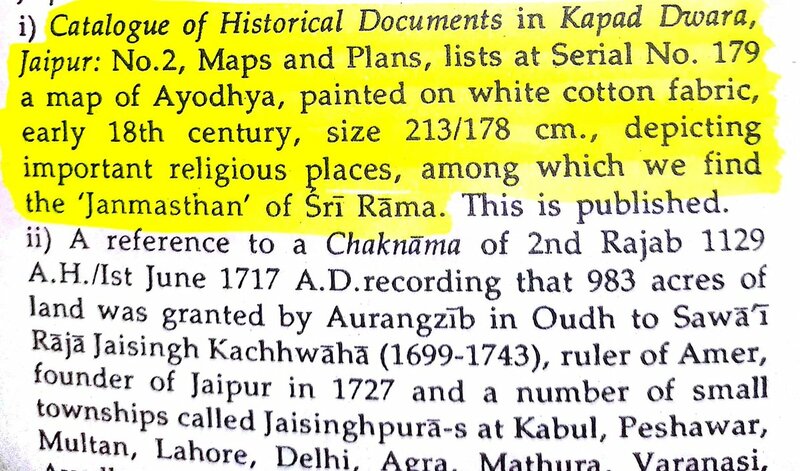 But the greatest discovery was that Grand Daughter of Aurangzeb herself have written about Ram Janmasthan. 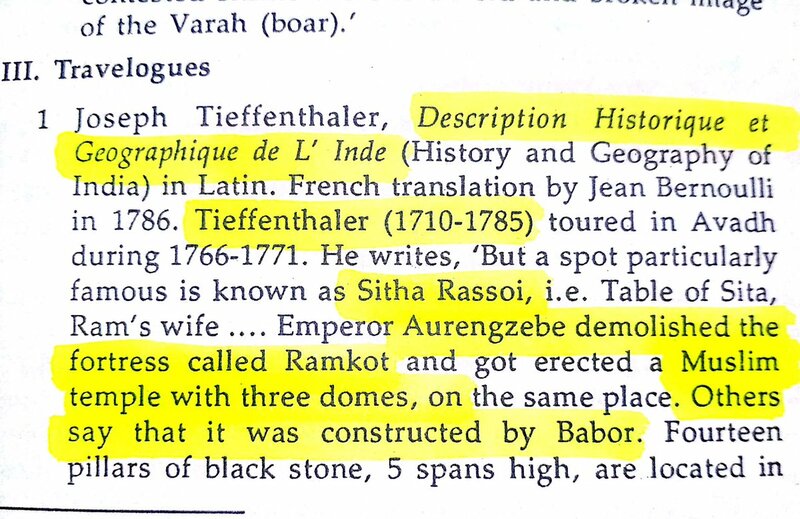 Book called "Sahifah-i Chhal Nasa ih-i Bahadurashah"
states that Babar did replace the Ram Temple with Babri Mosque. 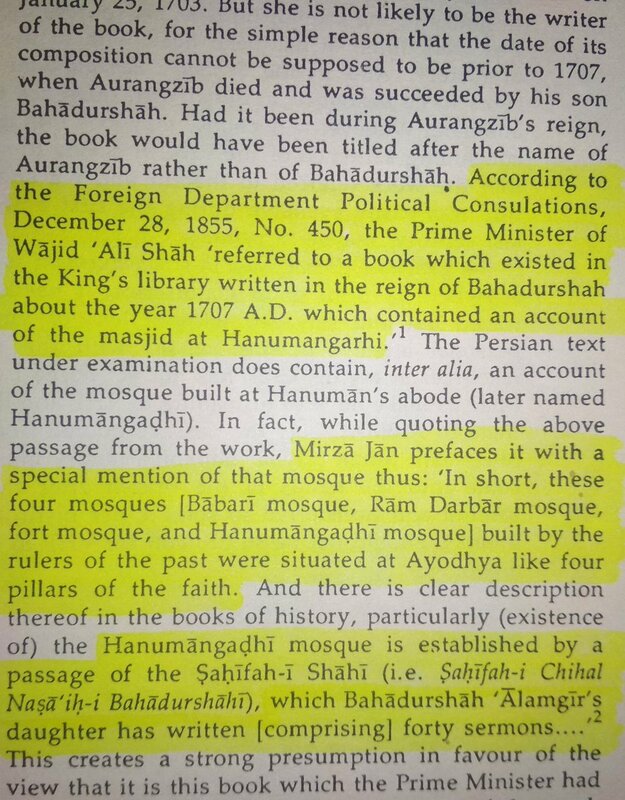 Mirza Jan a jihad warrior and was in pursuit to recapture hanumangarhi from the hindus. 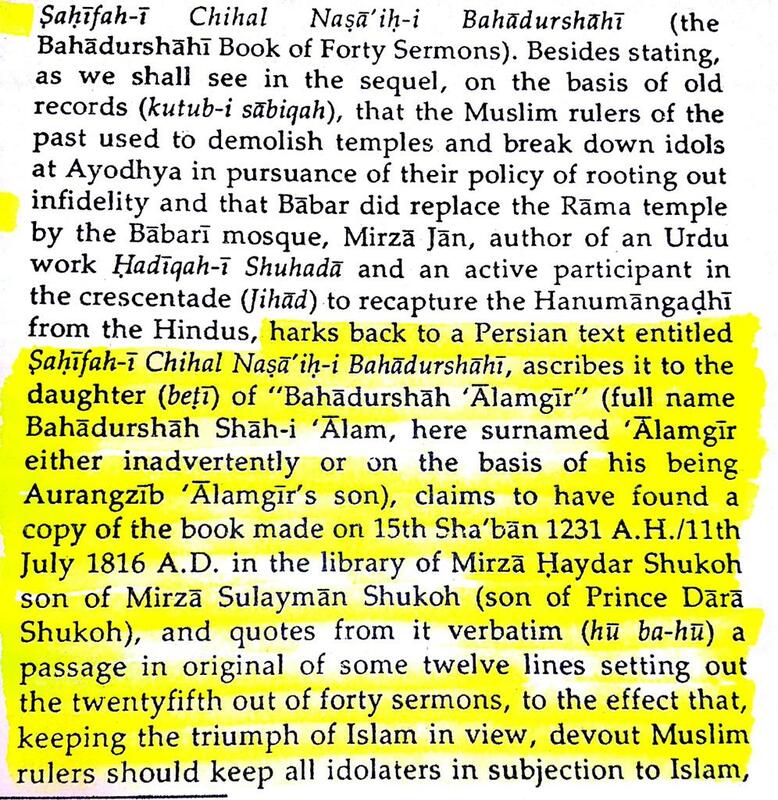 He describes the book Sahifah-i Chihal Nasa ih Bahadurshahi ascribes it to the daughter of Bahadurshah Shah -i Alam surnamed Alam gir on the basis of Aurangzeb using Alamgir surname. 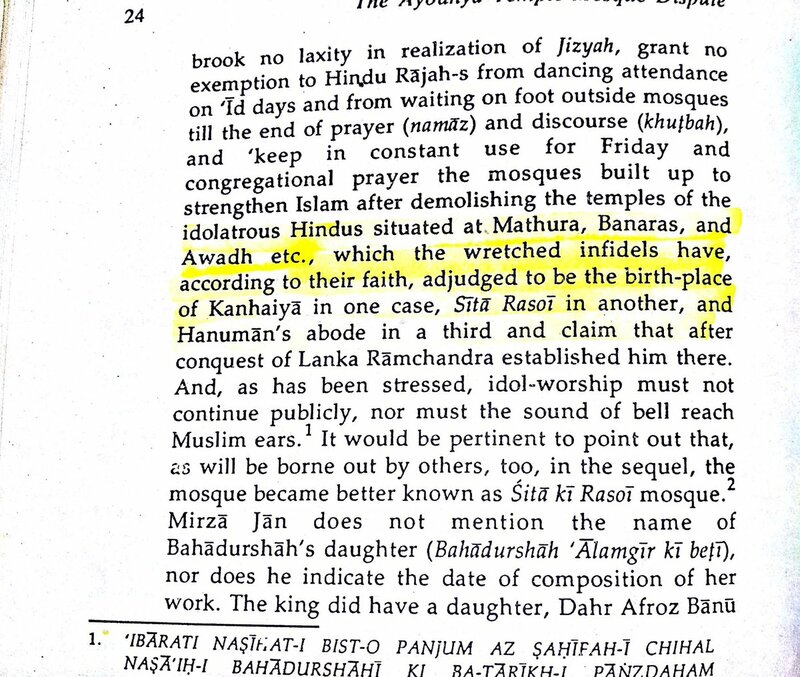 Mirza Jan found a copy of the above mentioned book it had lines destruction of temples in Mathura , Benaras and Awadh adjudged to be the birth place of Kanhaiya , Sita Rasoi and Hanuman Abode. 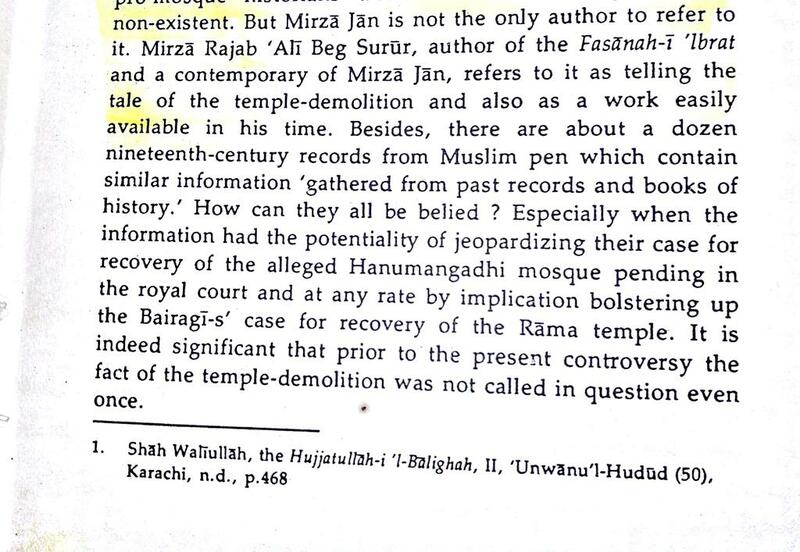 Mirza Jan was not the only writer to refer to the book Mirza Rajab Ali Beg Surur also mentions it. 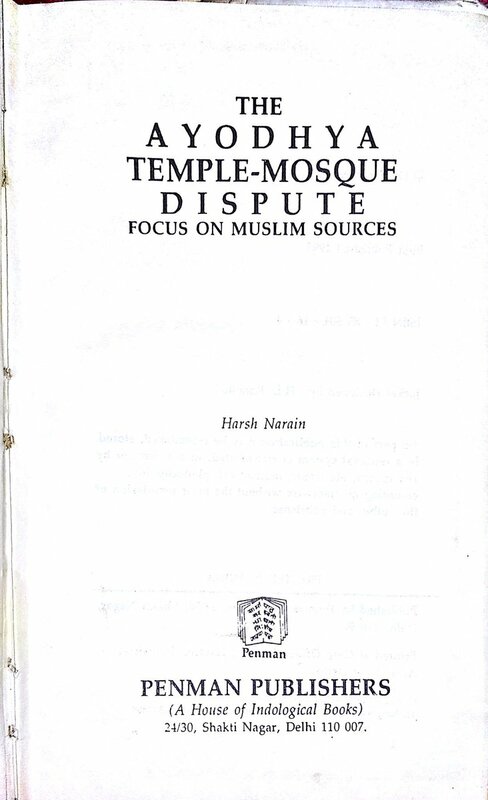 All these references are taken from The book Ayodhya Temple Mosque Dispute written by Late Prof Harsh Narain. 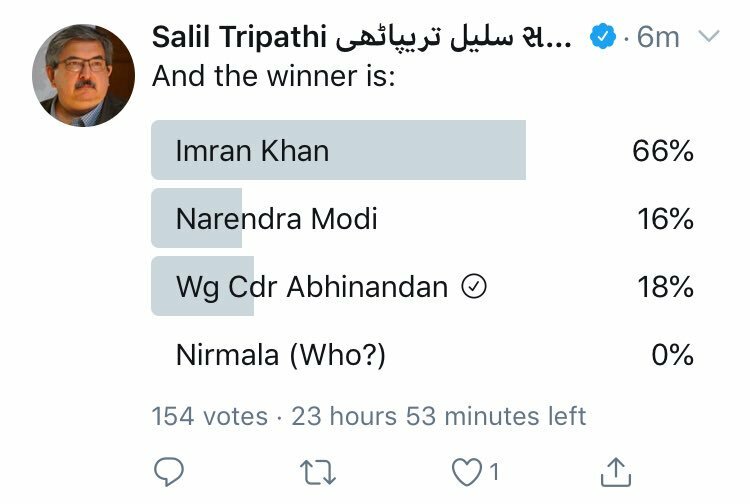 There are just so many more facts but can't be tweeted for that you have to read the book. 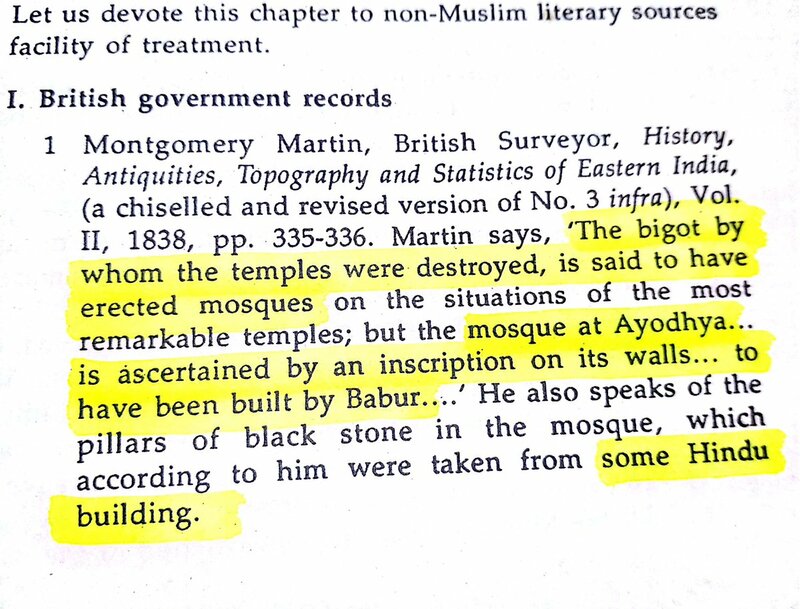 But the greatest discovery was that Aurangzeb's GrandDaughter herself has mentioned about the destruction of ram temple. 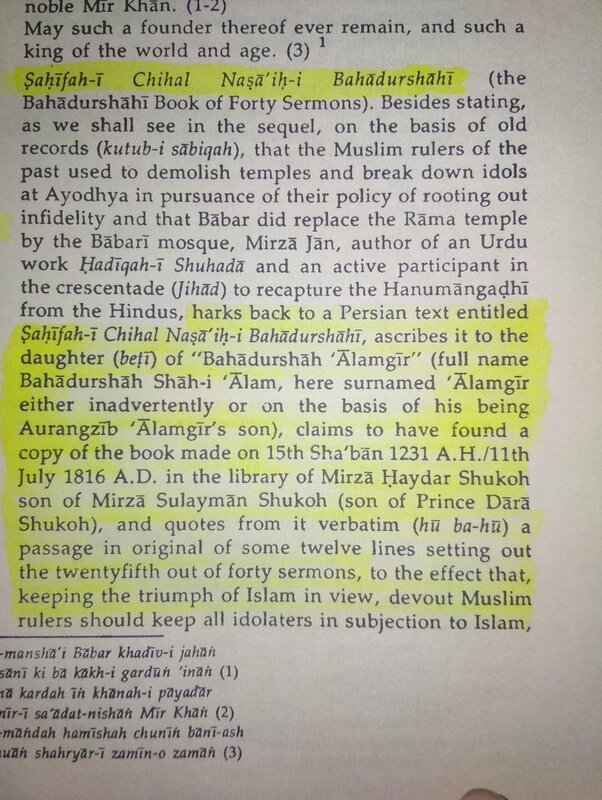 In the Book Sahifah-i Chihal Nasa ih-i Bahadurashahi. 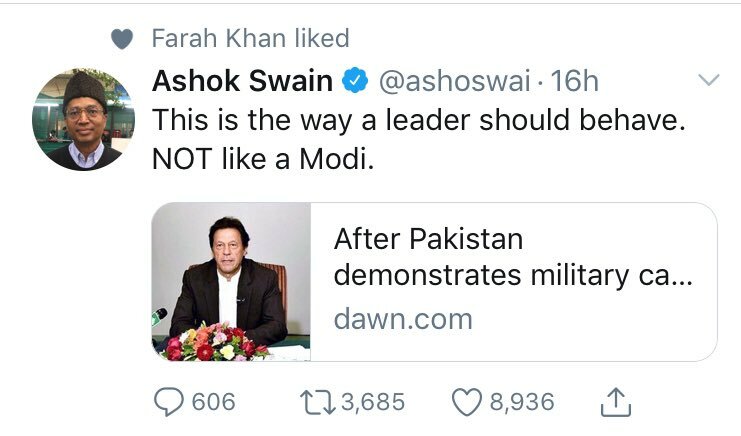 It is mentioned clearly. 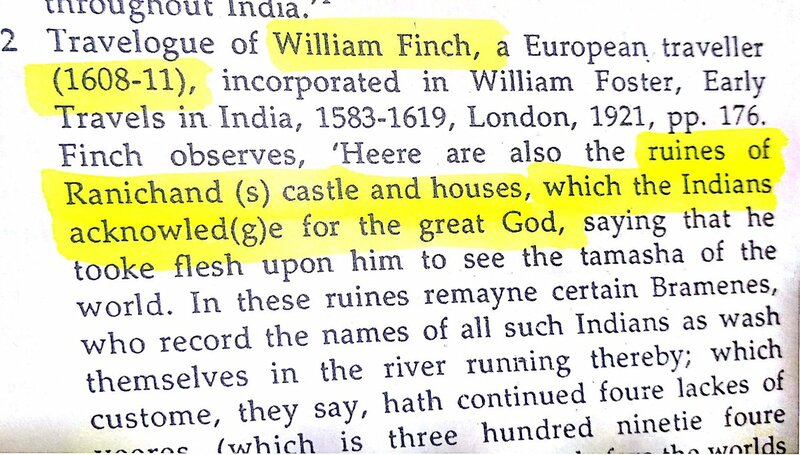 It not only mentions Mathura, Benaras and Awadh mentioning the names of Kanhaiya,Sita Rasoi and Hanuman's Abode. 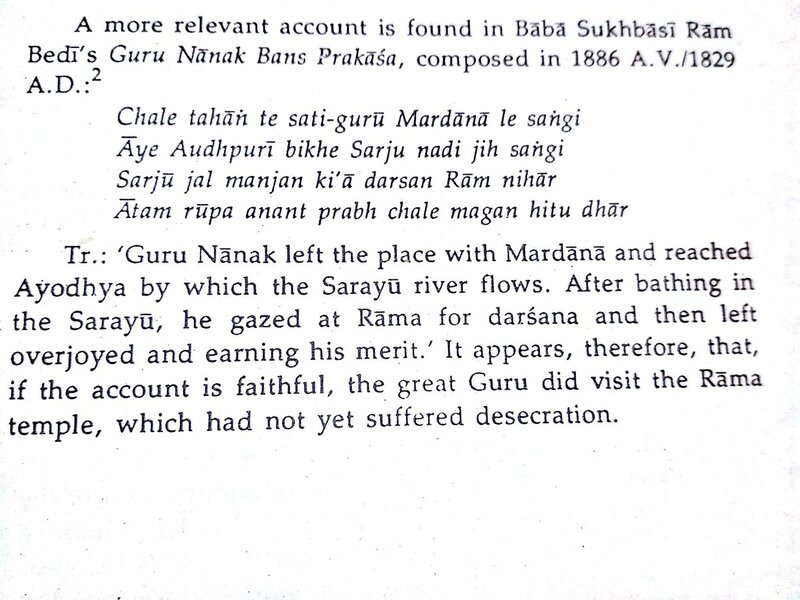 Mirza Jan a Jihad warrior came across this book as he was in pursuit of recapturing Hanuman Garhi. 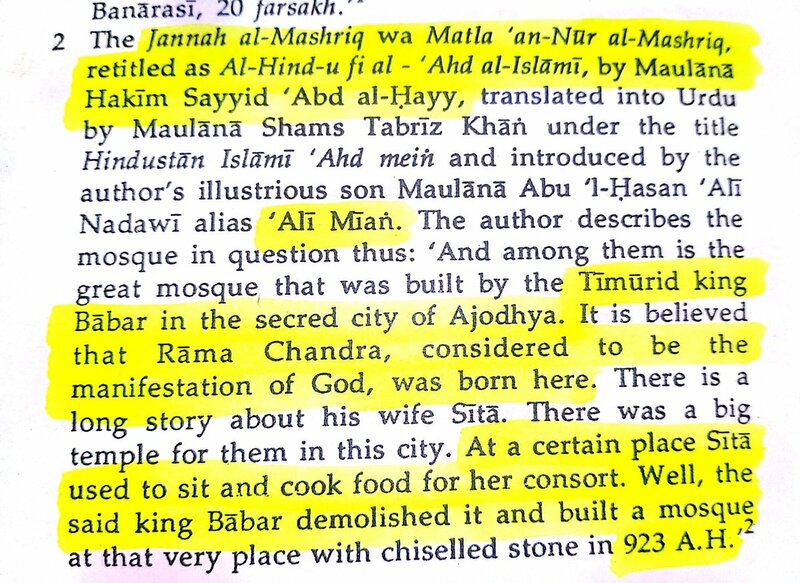 Mirza Jan was not the only author to refer about this book infact Mirza Rajab Ali Beg Surur of the Fasanah I ibarat refers to it telling the tale of temple destruction. 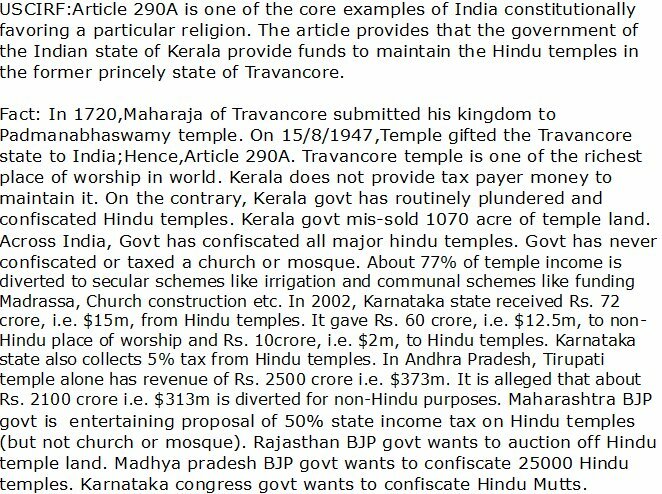 For those who say that mosque be built beside the temple may note that it is written very clearly in the book that " Sound of temple bell must not reach Muslim Ears"
2/n I’m sure that there shouldn’t be any debate on the fact if Pulwama Suicide Bombing that made us lose 44 @crpfindia jawans wasn’t conspired by JeM as it was just in few minutes that the video was released by the responsible. 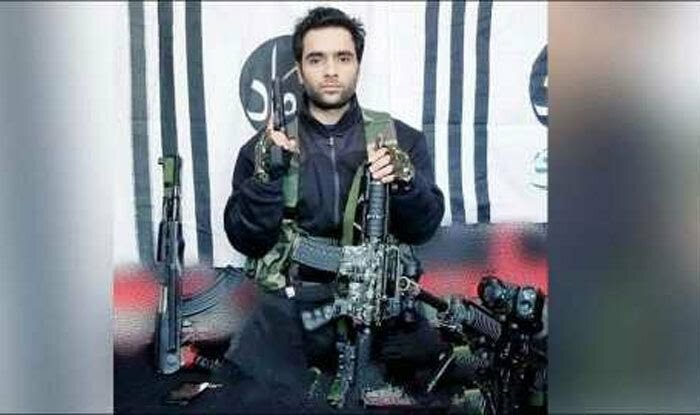 3/n In a video that surfaced online following the attack, Dar – seen dressed in tactical gear, holding rifles while seated in front of a JeM banner – said that he had prepared and waited for this moment (the Pulwama attack) for a year. 2/ This is like....a lot of stuff. 3/ It takes a lot of reflection to understand the complexity of this entire ordeal. You are one person. With many complexities. Imagine trying to navigate the oversight of the entirety of a country. Long story short-there is a reason this is drawing out like it is.